Blowout Sale! 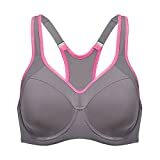 Up to 51% off on Sports Bras at Femi Store. Top brands include Cabales, Fruit of the Loom, AIYIHAN, Vibrant Vixen, SYROKAN, YIANNA, AKAMC, NIKE, CRZ YOGA, COLO, Capricia O'dare, & Move With You. Hurry! Limited time offers. Offers valid only while supplies last.